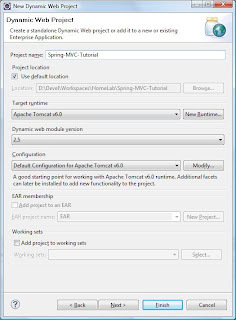 In this post, we'll see how to get started with a Spring MVC project in a few steps. 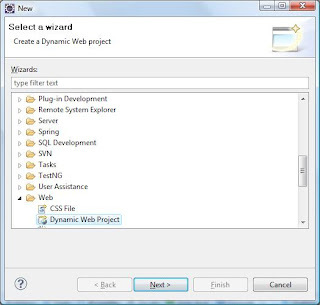 Then, right-click on the project and choose Maven -> Enable dependency management. This will open a Wizard in which you'll be able to configure Maven related information such as the group ID, the artifact ID, and so on. Following this tutorial, simply keep the default values and click on FINISH. Note that we have added the "maven-war-plugin" to specify that at the WAR file generation, the "WebContent" directory should be considered as being the web application root directory. 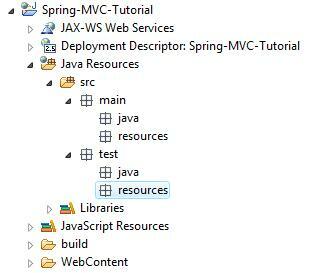 A Spring-MVC project follows the "Front controller" pattern : we'll define a servlet based on Spring's DispatcherServlet class. This servlet serves as "front controller" and will handle incoming requests. It will then dispatch them to the appropriate controller classes, based on each request's URL. As you can see, in our example, we've mapped all incoming requests with the ".do" extension to be handled by the servlet named "MyDispatcherServlet", which is the front controller to our application. We will be using the InternalResourceViewResolver to define which view should be rendered to the user, once the controller class has handled incoming requests. More on this below... For now, just try to remember that we gave its "prefix" property the value "/WEB-INF/views/", and its "suffix" property the vlaue ".jsp". Create a package named "controller". This package name is not arbitrary. It should match the package name that we've specified in the <context:component-scan> element in the Spring configuration file. Then, create a class as follows. You may choose another the name as it is not significant : due to our Spring configuration, Spring will scan the "controller" package and look for classes with Spring annotations (such as @Component, @Controller, @Service, and @Repository). The @RequestMapping annotation marks the handleRequest( ) method as a method that will be executed to handle GET method requests with /home URI. Basically, whenever an incoming request is handled by the handleRequest( ) method, as it returns unconditionally "welcome", the view resolver from type InternalResourceViewResolver will concatenate the defined prefix, to this value, and then to the defined suffix. With the M2Eclipse plugin, simply run the project as "Maven package". 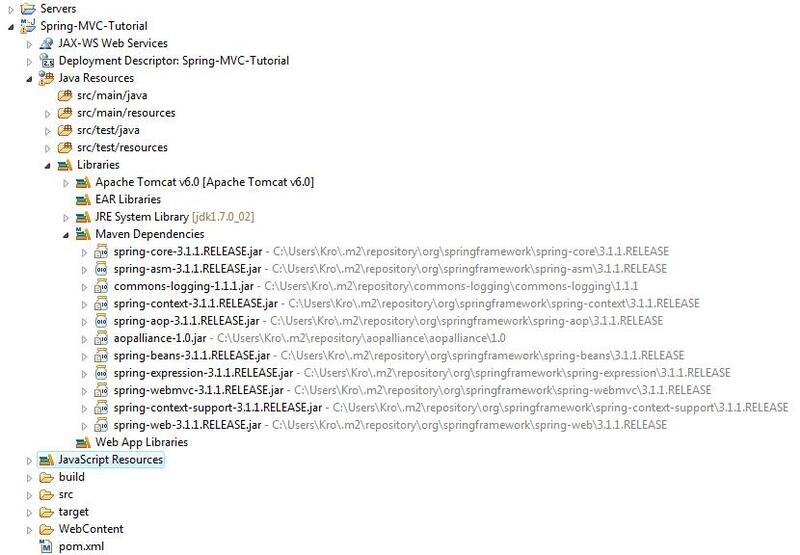 Then copy the generated WAR file from the "target" directory into the "webapps" directory from Tomcat. The project we went through step by step, may be downloaded/checked out (github repository) here. Just make sure you get the master branch of the Spring-MVC-Tutorials repository. the url-pattern as "*.go" but say that we've mapped all incoming requests with the ".do" extension. That might throw a newbie for a loop if they're just doing copy/paste. hi, thanks for the example. i try to run it but encounter problems. 3. when i open the war file, i cant see the view directory inside the WEB-INF directory (nor the jsp file). why? To answer to your first remark, the 8080 is usually the port that is used with standard Tomcat configuration. You may configure it to use another port if you want to, though. From your third statement, I believe the war file you does not have the expected structure. How did you generate it? 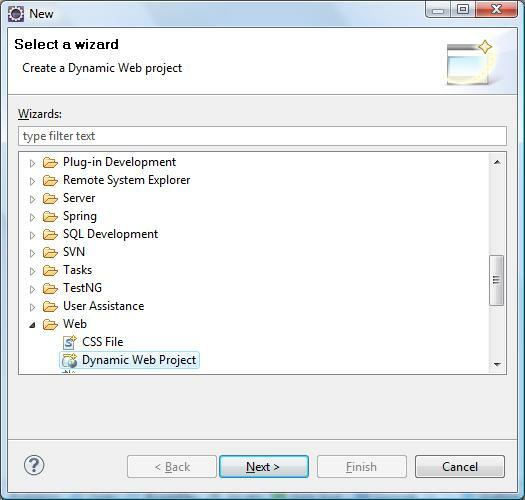 Through the export wizard from Eclipse? If so, it's normal because, it is a maven project and as you can see in the pom.xml file, I've configured it so that the webContent directory is considered as the root directory of the application. If you use Maven to generate the war, it will deploy just fine. If you have the M2Eclipse plugin, simply execute the package goal on the project and you'll find the war file in the target directory. You may execute > mvn package on the project as well, if you'd rater use Maven command lines. hi Yiu, thanks for your quick reply!! Just for the record, i am a maven newbie. I am using eclipse->m2e, so i create the war using run as->maven install. i think i got this automatically from transforming the project to a mavan project. Do you get any error message in the console when deploying the application on your embedded Tomcat configuration? If not, my guess would be that you're not accessing the correct root context. it seems like i have several problems. so, i deleted the post-fix of "-0.0.1-SNAPSHOT" and now i see an exception (which is good). i am not sure where should i run the project from. from eclipse or externally? is there a convention for running eclipse-tomcat-maven projects? should i install a tomcat plugin? it seems like the spring is not configured well. 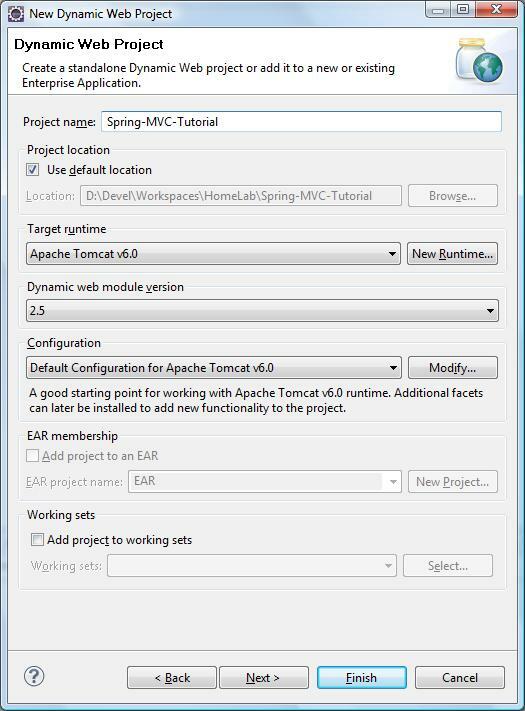 No, you don't need any Tomcat plugin to get a Maven-based web application project to run into an embedded Tomcat instance. Sounds like the Maven dependencies of your project are not deployed on the embedded Tomcat. 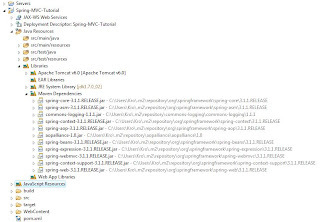 Did you check that your project's deployment assembly contains the Maven dependencies? To do that, right click on your projet, open its properties and click on the "deployment assembly" section. Then, you need to add the Maven dependencies (click on "add", choose "Java build path entries" and then Maven dependencies). Let me know if you worked out your problem. Great tutorial for maven/spring newbies like me. Btw, I'm using Netbeans and after completing the project, I had some errors in dispatcher.xml. Changing tag as follows fixed everything. If someone receives error this may help. Hello,thanks for your great tutorial. 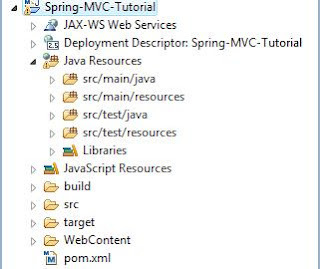 org.springframework.beans.factory.BeanDefinitionStoreException: Failed to read candidate component class: file [C:\ItDevelop\Tomcat7\webapps\Spring-MVC-0.0.1-SNAPSHOT\WEB-INF\classes\controller\MyController.class]; nested exception is java.lang.IncompatibleClassChangeError: class org.springframework..
How can I fix this problem, thanks very much! Based on the type of error you got, you may either have two (or more) different versions of a same .jar, or one of the dependencies is providing an implementation that does not match its associated interface. I suggest you take a look on StackOverflow as others faced the same kind of problem (for instance: http://stackoverflow.com/questions/13528508/spring-mvc-hibernate-project-throws-incompatibleclasschangeerror-tomcat-7). Very well written tutorial. Thanks for posting this.